. : Pierre-Olivier Dorego :: Ski XCOttawa.ca :: Skiing in Ottawa and Gatineau Park :. Pierre-Olivier is one of XC Ottawa's younger generation that is planning an unmerciful attack on those getting long in the tooth. He likes to ride bikes in the summer, and he actually LOVES to rollerski. Now this is, indeed, a rare romance, but it has paid off several times for the man we call P.O. As a junior, he finished fourth in the open men category at the Quebec Sprint Championships in 2004. 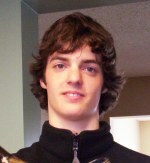 He had the 8th (Junior Men) fastest time in the skate portion of the pursuit at the 2004 Nationals. His riding skills have earned him numerous top five finishes at the provincial level in both road and mountain biking. XC Ottawa has needed a good sprinter for a long time, and we just might have finally found one!